Crying is just for babies right? In a starred review, "Publishers Weekly" said of Kate and M. Sarah Klise's first picture book, "Shall I Knit You A Hat?" "The Klises consistently sound notes of tenderness and humor." They continue to do so as Little Rabbit and his mother return in a sweet new story. Little Rabbit is about to turn five, and he decides he's all through with crying. He doesn't want crybabies at his birthday party, so he tells his friends they can come only if they're big, like him, and don't cry anymore. When all of his friends admit to crying sometimes, Little Rabbit is shocked. Does everybody cry? Why? "Why Do You Cry?" 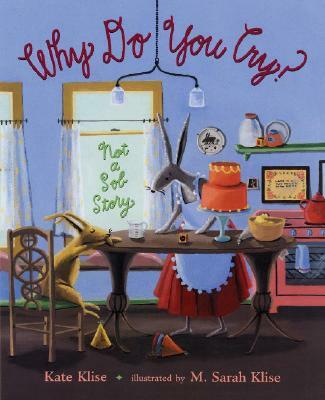 is a 2007 Bank Street - Best Children's Book of the Year."